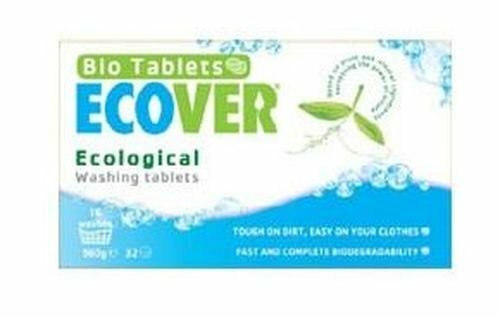 Ecover Laundry Tablets: Exceptional washing results, even at low temperatures, No optical brighteners, Suitable for all whites and, colourfast laundry, Fresh perfume from plant based ingredients, Quick and complete biodegradability,Minimum impact on aquatic life and against animal testing, Suitable for septic tanks. Ingredients: 15-30% Oxygen-based bleaching agent, Zeolite, 5-15% Anionic and non-ionic surfactants, Cellulose, Disilicate,Bicarbonate, <5% Polypeptides, Soap, Bleach activator, Citrate, Glycerine, Magnesium sulphate, Bentonite, Cellulose derivates, Perfume ( Type:Lavender Contains:Limonene, Linalool). Ecover biological washing tablets are recommended for whites and colourfast laundry. They are convenient and economical to use. For a load of normally soiled laundry use two tablets (60 g). Open the film around the tablets with the tearstrip and place the tablets into the dispenser. Run your machine as per the manufacturers instructions. Use three tablets (90 g) for heavily soiled laundry and for hard water. Tablets are not recommended for handwashing. Dosages for one full wash (4-5 kg). If you have any questions about this product by ECOVER (UK), contact us by completing and submitting the form below. If you are looking for a specif part number, please include it with your message.